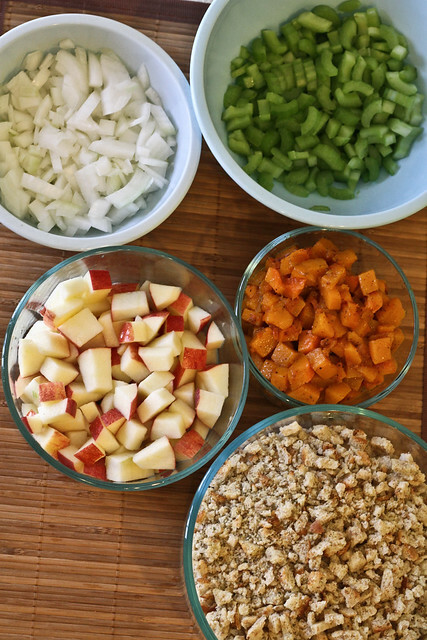 Because it’s so super helpful to post a recipe for something like stuffing AFTER Thanksgiving has happened. But hey, it’s possible that there is someone out there who makes stuffing for Christmas dinner too, right? RIGHT?! Well, at the very least, perhaps someone will want to file this away for next year, since it is pretty much the most awesome stuffing I’ve ever cooked/tasted/looked at. This robust, savory stuffing has all the classic flavors of Thanksgiving, with the added bonus of butternut squash roasted with cinnamon to give it an extra zip. 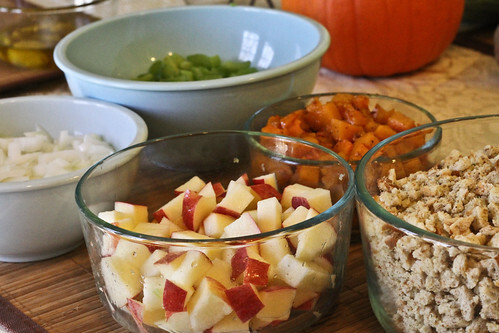 This would also be delicious with the addition of some chopped walnuts or dried cranberries. Enjoy with turkey and gravy, or simply by the spoonful! 1. Preheat your oven to 350 degrees. Toss your butternut squash in the oil, cinnamon, salt and pepper then place on a baking sheet and roast for 25 minutes. 2. Meanwhile, chop and dice the rest of your ingredients, then melt the butter in a large pan (with high sides) on medium heat. 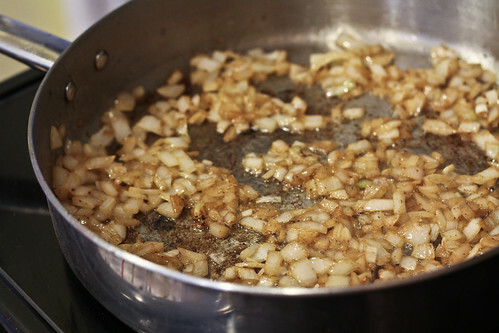 Add the onion and cook until it begins to get soft and translucent, 3-4 minutes. 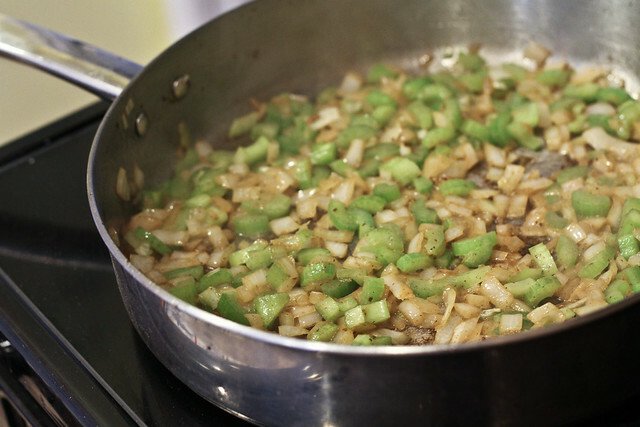 Add celery. 3. 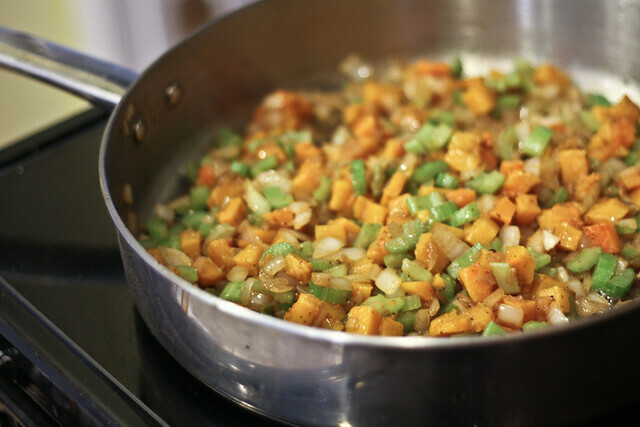 When the butternut squash has finished roasting, mix it into the onion and celery. You want to be careful when mixing now, as the squash is probably very soft. 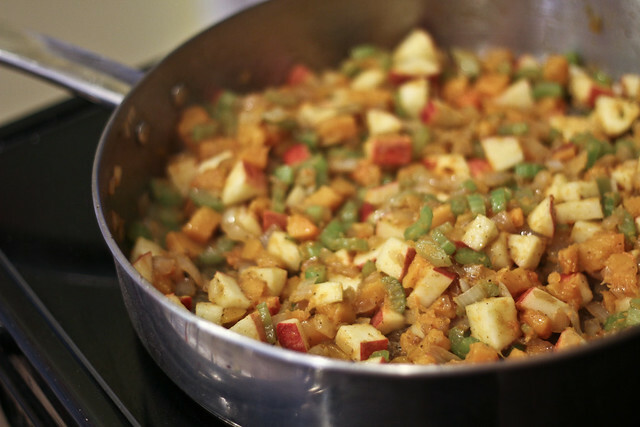 Add the apples and saute an additional 2-3 minutes. 4. 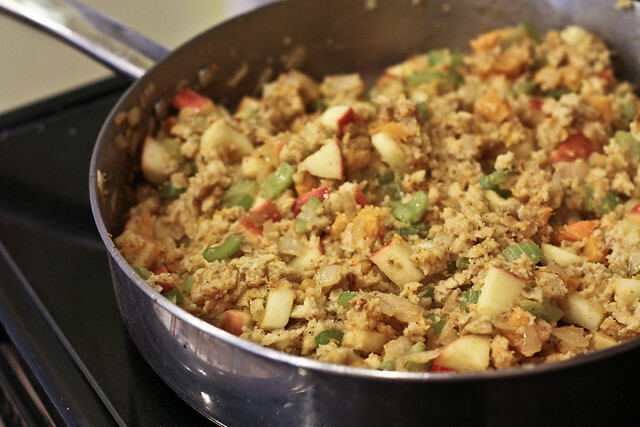 Add your dried stuffing mix directly to the pan, then pour water and vegetable stock over it. Mix the combination well. Add additional stock as necessary to achieve desired moistness. 5. At this point, you may transfer the stuffing into a casserole dish and bake for 10 – 15 minutes to achieve that crisper, drier top layer, or simply serve as-is. I love stuffing. Any idea of weight watcher points on this? Looks yummy. 129 calories, 6 g fat, 16 g carbs (3 g fiber), and 2 g protein. Thx! Adding these ingredients to grocery list. Love squash and apples together. Thank you. 3 pts per serving is so doable! You betcha! And I made Ben save you some mashed taters too. But you better get back quick! Yay! I’ll be there in 4 hours!! Thanks for posting this! It looked so good!!!! We had a ham Thanksgiving so no stuffing. 🙁 I think we’ll need to have a turkey and stuffing dinner soon, just for the heck of it! Oh- and we cooked our turkey using Alton’s recipe- all because you posted it on your site. 🙂 It turned out AWESOME. 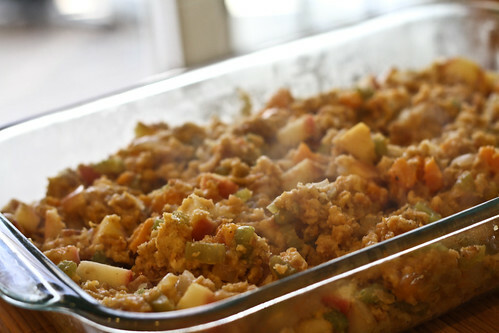 Stuffing should be acceptable at any meal between October 1st and Jan 1st. Making this ASAP. I love me some butternut squash. My mom’s kind of doing a T-day dinner for Thanksgiving so I’ll give her the link to your site for these delicious recipes! !